Every sensei has a favorite, his heir to be, the prodigal son, that by fortune or fate he loses, sometimes tragically. When I first saw Ramón it was in the Ochoa Dojo, and he was 14-15 years old. A big kid even then, 6 feet tall or more. He was good, a natural, although somewhat of a badass with a short fuse. He'd stare at you like if he meant business. He reached brown belt while in Ochoa. Aloof and serious as a stick of dynamite. Ran into him again in the Violeta Dojo under Kimo sensei. Same attitude, but stronger, he had grown, late teens. Kimo kept him on a short leash. Word had it that he was Kimo's pet student, he doted on him. Oftentimes I'd see Kimo give him a dressing down off to a corner. Other times I'd see him sparring with Kimo before or after class, real intense kumite. The kid, as they say now, was awesome. Great style and powerful delivery. Very powerful. Then one day I didn't see him anymore. I finally learned that Kimo had kicked him out of the Dojo for drug use. I couldn't believe it. They told me Ramón got heavy into drugs and that Kimo got tired of cutting him slack. Many years later when in a conversation about the"old dojo days," I asked about Ramón. They confirmed the drug story but added that the real reason was that Ramón overdosed, got stuck in the "trip" and never really came back. They told that Ramón had gotten a girl pregnant while in Kimo's dojo, married her and shortly afterwards became a sort of walking zombie. I knew then that the middle-aged guy I saw once in a mall was truly him: old beyond his years, trailing behind some woman. I couldn't believe it. I was well into my 50's when in my last dojo we had a welcome party set up for Kimo who was visiting the Island. It was to be a surprise party where all of Kimo's past student,s active and inactive, in Puerto Rico would be present, including Ramón. It was an emotional night for all of us, but when finally Ramón arrived with his wife and Kimo and he embraced, tears streaming down both their faces, there was a silence among those of us who knew and a vibe that sent chills up our spine. 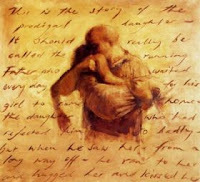 The prodigal son.